Working for the United States Postal Service can be a strenuous job. To do so for 30 years without any type of accident is a remarkable accomplishment. 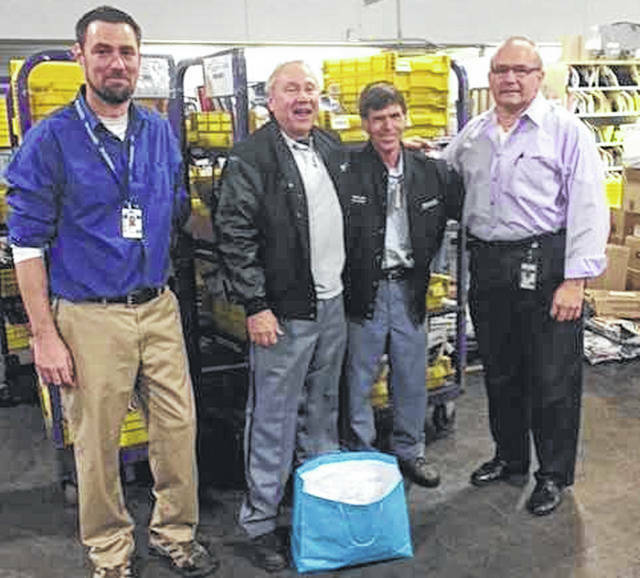 On Nov. 9, the Delaware USPS office honored not one, but three of its mail carriers with induction into the “Million Mile Club,” given to mail carriers who have either driven or walked one million miles or have worked 30 years with the company without incident. Bill Ross, Steve Mackert, and Randy Hartman were honored with plaques and leather jackets to commemorate their inclusion into a club that Delivery Supervisor Luke Walker called “rare,” given the 30-year duration in which so many things can happen while on the job. “This was the only thing I had left to achieve in my postal career,” Mackert said of the award. “I am happy to be recognized and appreciate the job.” Mackert is in his 32nd year with USPS and has been on the same route for 20 years. His route includes North Liberty Street up to Pennsylvania Avenue and west to Euclid Avenue. Ross is in his 30th year as a mail carrier and works as many as five routes, including the downtown route. When other carriers are off, Ross, who is referred to as the “super sub,” will man their routes. Because he was on leave, Ross was not at the ceremony and was not available for comment on his award. USPS partners with the National Safety Council (NSC) to award their safe drivers into the club, which is the highest honor given for professional drivers by the NSC.